To meet our Health and Safety obligations and maintain a safe environment for all, please observe our alcohol policy. Guests arriving intoxicated will not be permitted on board our vessel, we reserve the right to terminate trips for Drunk and Disorderly behaviour. Refunds will not apply in these instances. Equipment lost/damaged due to negligence will be charged. Advertised charters may be varied to suit sea and weather conditions. On booking guests must advise the staff of any medical conditions. It is important that you contact us the evening prior to your departure to confirm favourable weather conditions. 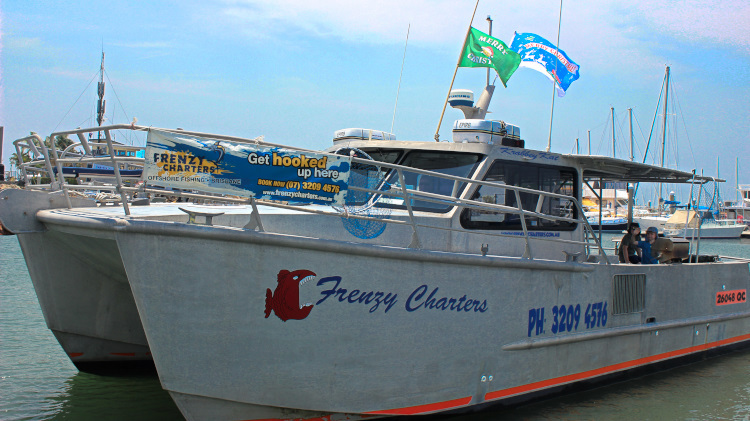 At time of booking a 100% deposit is required for individuals and 50% for private charters, fully refundable with 7 days notice or Frenzy Charters cancel trip due to inclement weather (not rain). Payment of the deposit constitutes a confirmed booking on your part, as we will not be able to take any further bookings to cover/replace the number of passengers you have confirmed, the total balance will be charged to your credit card should any or all of your party not show on the day. Temporary bookings will only be held for 24 hours without deposit. Charters operate 7 days per week and are subject to:- suitable weather conditions and sufficient numbers (where applicable).